Steampunk fashion combines Victorian sensibilities with science-fiction technology, creating a blend of history and the future that results in a range of exciting styles. Complete your latest steampunk ensemble with the help of the mens steampunk footwear that you can discover here in this section. Our mens steampunk boots and steampunk shoes include a variety of eye-catching designs with interesting buckles, decorations, and other Neo-Victorian details. Several of our designs come in black or brown, giving you options to help you find the right look for your steampunk outfit. Whether you want to dress up like a steamship captain, a steampunk gentleman, or a quirky cyberpunk inventor, you will find high quality steampunk footwear options for your attire here. 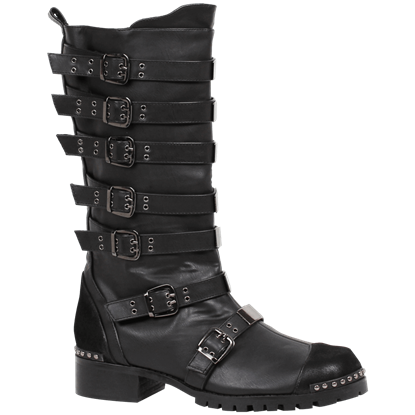 The Simple Steampunk Boots are a great mens Steampunk boot and would look great with any Steampunk, Modern, or Gothic attire. 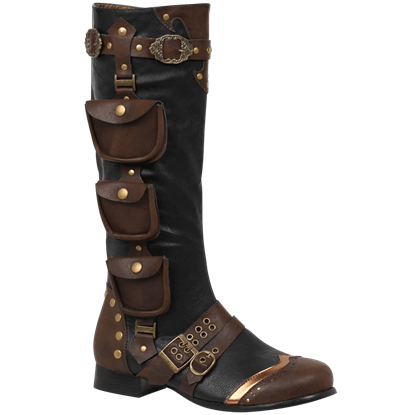 These Neo-Victorian boots are made from real leather and are adorned with antiqued brass gear buckles. You will never run out of storage space when you wear these Steampunk Excursion Boots, featuring snap pouches that run the length of the boot. Decorated with ornate buckles, these mens boots are perfect for inventors and smugglers.